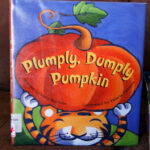 Plumply, Dumply Pumpkin by Mary Serfozo was the perfect book to continue our pumpkin themed preschool activities this week. I found this idea from The Mailbox Magazine a couple years ago and was excited to revisit it again with my daughter. 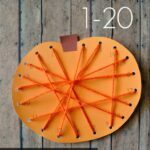 Prior to reading the book, I cut out 10 round pumpkins and 10 lumpy pumpkins out of orange cardstock paper. I had a pattern from The Mailbox Magazine (Oct/Nov 2010 issue), but you could easily just draw out a pattern of a lumpy and round pumpkin yourself. 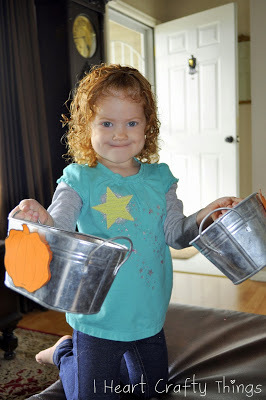 I hid the pumpkins around my living room for her to find after we read the book. 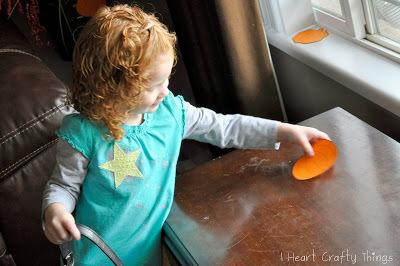 After reading the book, I set my daughter loose on her pumpkin hunt in my living room. 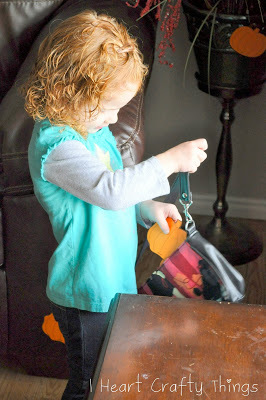 After she found a pumpkin she put it in her purse. 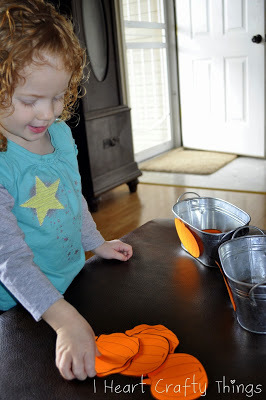 When she was done finding all of the pumpkins we got them out of her purse and counted them. 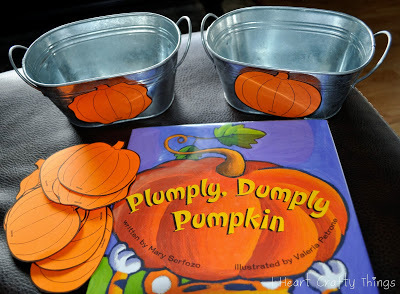 Then I attached a round pumpkin and a lumpy pumpkin to the front of two tin buckets and my daughter sorted each pumpkin in the right container. 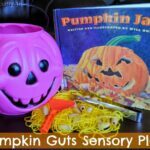 Such a fun preschool activity!! I like to post pictures of our activities on Instagram so if you’d like some sneak peeks now and again and a glimpse our silly life, you can follow me HERE. This looks like so much fun! I will have to look for the book. I am going to share this post on the Read.Explore.Learn Facebook page today.